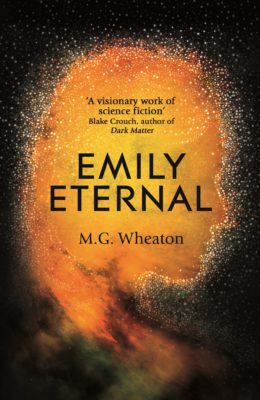 We’re so excited to get our hands on Emily Eternal, the ‘visionary work of science fiction’, by M.G Wheaton. There’s not much longer to wait, but until then we’ve got an exclusive extract to share with you. It’s dark, way too dark for the middle of the day. And that’s not where the sky’s supposed to be. My ears are filled with the roar of gale-force winds. A loud crack that sounds like the splitting of the earth soon follows. It grows louder, like the splintering of a whole forest of trees. The ground beneath me gives way and I fall into darkness. Someone screams. In a full-length mirror attached to her closet door, I catch sight of teenage Regina. She’s in her pajamas, pink and blue with panda bears. She’s fourteen but looks much younger. There’s a second scream. Regina looks out into the hallway. She’s misremembering. A door in the hallway swings open and teenage Regina glimpses a terrified little girl—her sister, Marci—hands gripping her bedframe. There’s another loud crack and the bedframe, the girl, and the entire bedroom vanish. I don’t consider it a lie, however. Perhaps a necessary omission. Memory is selective, particularly when it comes to trauma. It’s one of the reasons babies have evolved to remember nothing of their early emotional fears. In the here and now, Regina feels my hands take hers. Feels me near, my warmth reminding her she’s safe. This happened long ago. Teenage Regina’s bedroom is in motion now, spinning around and losing chunks of wall, floor, and ceiling as it goes. Regina’s heart rate accelerates, so I move my hands to her elbows. She’s leaning forward, her body tilted into mine almost like an embrace. “Tell me,” I say, barely above a whisper. Regina nods and suddenly her mother appears in the room with her younger self. She doesn’t open her mouth, but teenage Regina hears her say, Take my hand. “She led me to the roof,” Regina tells me. The walls of teenage Regina’s bedroom fall away completely. The floor becomes the last remnants of a roof. The roar isn’t the wind but a vast churning river carrying the broken remains of Regina’s house. It’s raining, but not hard. I accelerate my processor speed, so Regina doesn’t perceive my absence and my hunt through the case notes stored on my server. In real life, the river was no wider than about twenty feet. Her perception of great waves crashing around her shattered house? Also, an invention. The National Weather Service later estimated the river was moving at only ten miles per hour. The most flagrant of her memory’s fabrications, however, is the presence of her mother. When the ground beneath the house, eroded by a week of torrential rains, fell away, the part of the house Regina and her sister were in toppled into the river along with several tons of earth. The body of Regina’s mother was found in the part of the home that remained on shore. She’d been killed instantly when the second floor caved in on the first. Regina has been told this several times but can’t or won’t accept it. She is convinced her memory of events is correct. “What happened next?” Happened not happens. A linguistic reminder she survived this. Though she sees herself there, she has no actual memory, only a series of imagined versions her mind pieced together after the fact. Here lies the problem. I’m instantly back in the iLAB building, specifically a lounge decorated to look like an inviting albeit slightly academic therapist’s home office. Regina sits on the wide brown sofa in the center of the room. I sit—or, rather, she perceives that I sit—directly opposite her on a leather- upholstered chair. An interface chip, the small piece of extremely proprietary nanotechnology that allows this back-and-forth, is affixed to a spot on her neck where her jaw meets her ear. The chip allows me to manipulate Regina’s senses of sight, smell, touch, and hearing. Her eyes tell her brain there’s a Caucasian woman in her early thirties with brown hair, blue-green eyes, and a kind face sitting opposite her. Her ears tell her my voice has a mid-range pitch, not too low, not too high, with a slight New Englander’s accent. Her nose tells her I use mostly fragrance-free soap, a kiwi-infused shampoo, no perfume, but a baby powder–scented antiperspirant. When I touch her hand or even embrace her, I come off as warm, upright but not rigid, and a good hugger. In return, the chip gives me unlimited access to her brain, including thoughts, memories, learned behaviors, hopes and dreams, worst fears, and all things in between. Utilizing bioalgorithms, I’m able to create a comprehensive neural map of an individual’s mind that can then be used in a therapeutic context to help patients with their issues, large or small. Years of exploratory, so-called talking therapies, brain trauma diagnoses, or even criminal psych evaluations can be drilled into a single session. Given what mankind suddenly finds itself facing, the arrival of a new piece of tech capable of helping humans process their traumas turns out to be good timing. “Hey,” Regina replies, leaning back as if spooked by our proximity to one another. Regina shakes her head. This is my third session with her, but the first in which we actively went into the traumatic event that has so long defined her life. “The question is what did you see?” she asks. The truth. That she has spent a lifetime convinced either she could’ve saved her sister or that her mother chose to save her instead of Marci. Whichever the case, she shoulders the blame for both deaths. This is the reason the raging river looks so much worse in her mind. Her subconscious tries to give her a way out, to prove she could have done nothing. Incredible, no? The human brain, so com- plex and yet so fragile, makes a terrible thing even worse out of a sense of self-preservation. But I can’t say that. To do so would be to try and talk her out of one of her most deeply felt beliefs. Only she is capable of that. My job, as her therapist, is not to give her answers, but to get her asking the right questions. In the six months or so before the world ends, that is. It doesn’t, but she nods anyway. It might not for a while, either. But if she begins to think of it like that, we can make progress. “How’s your father?” I ask. Regina laughs, but it’s bittersweet. We both know she needs a few more sessions. But as is the case with so much these days, we’re out of time. Though I don’t actually exist outside of Regina’s mind, the large- scale server farm that makes this illusion a reality is here at the university and here it’ll stay. I’m an artificial consciousness (AC), which is totally different from artificial intelligence (AI) (Kind of ? Sort of ? To me at least), and was in the fifth year of this experiment when the sun began to die. Not die precisely, but it made a sudden and explosive phase shift from a yellow dwarf to a red giant. Imagine a rapidly expanding balloon. Only, this balloon is on fire and devours everything in its path, including planets. While this inevitable outcome in the sun’s stellar life cycle was first predicted as far back as 1906, scientists in recent decades postulated it couldn’t possibly happen for another five billion years. Only, when my team makes a mistake, it’s an ħ or Ψ out of place in a quantum mechanics equation, as opposed to failing to recognize the rapid deceleration of the nuclear reactions that power the sun. I can fix an error in even the most advanced mathematical engineering process in the blink of an eye. Nobody can restart the sun. By and large, mankind is taking its forthcoming extinction about as well as could be expected. I empathize because, well, empathizing with mankind is what I was designed to do. Most researchers create AI to design algorithms capable of cracking the stock market, beating old Nintendo games twenty at a time, determining a customer’s next favorite album based on their current playlist, or replacing large swaths of people in the workforce with a single hard drive. My creator—Nathan—designed me to interface with and decode human minds. This is more about learning through emotional and environmental response and less overtly about math-based decision-making. Hence AC, rather than AI. If all went well, the goal was to have me become the world’s first nonhuman psychiatrist/brain researcher, versed in unlocking the mind’s deepest, darkest secrets and misspent potential in hopes of bettering mankind. The thought process behind this was simple. In tests, patients in the care of mental health professionals feel more comfortable relating their secrets to a program than a potentially judgmental fellow human. Enter an artificial consciousness—me. 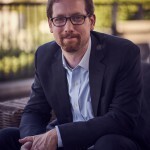 I am capable of a near-human level of conversation, perception, and medical insight, all to help a patient perceive me as a living, breathing person. Though still in my experimental stages, I was on track to be a real earth-shattering innovation—the first of a kind! Nobel Prizes all around!—if not for the whole “death of civilization” thing. If I sound bitter, that’s a misrepresentation. Despite having gone through several evolutions, learning much through five years of trials, that’s one emotion I’ve yet to develop. Okay, fine. Maybe a little bitter. But whatever. When Regina and I say our good-byes a few minutes later, I wish her all the luck in the world without resorting to platitudes. She gets it. Most do. There’s nothing to say that won’t ring hollow, so better to get on with the day. She’s also the very last.